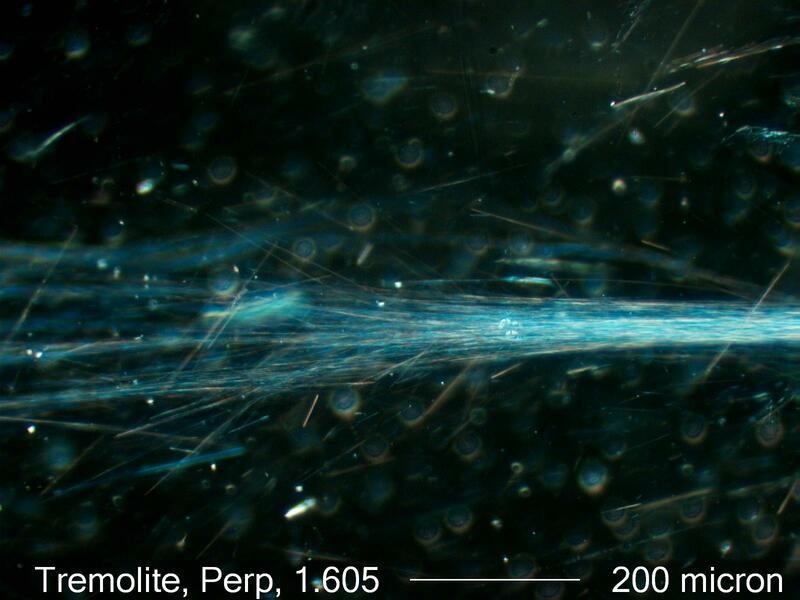 The D-line refractive index across the width of this sample of tremolite asbestos is about 1.603. It matches the refractive index of the Cargille High Dispersion 1.605 liquid at a wavelength of about 660 nanometers. At this wavelength the Cargille liquid has a refractive index of about 1.597, as does the tremolite. This Type of Dispersion Staining produces a single color for any given wavelength match between a given liquid and solid with a fixed single linear polarizing filter. Oblque condensor darkfield dispersion staining produces the same colors as objective cental stop dispersion staining but the particles are in much better focus. As a result it is easier to see the particles that are producing the effect.